Cushion Moss For Sale Online. Low Wholesale Prices. 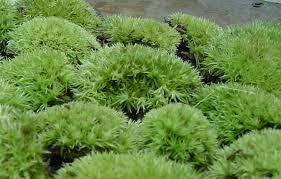 Cushion Moss, is also known as Leucolory, more commonly white moss. They grow best in hardy planting zones 3-11. The growth rate is considered medium. Cushion moss can grow in a large clump that looks similar to a cushion. The clumps size ranges anywhere from just a few centimeters to a meter in length and only about one to four inches high. 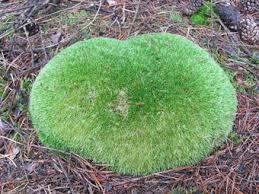 Some say this moss looks like an oversized pincushion or a plush, fuzzy chair cushion. It can grow in shady areas and can tolerate some sun, but not full sunlight. The roots of this moss prefer moist, wet and well-drained soil to grow at its best but can become easily adaptable. It also prefers to be on the ground that is sandy. This moss can be grown in natural areas, around rock gardens or water features to liven it up. This moss can grow anywhere. The moss can have its growth stunted by grass clippings or if weeds interfere with it. If too many grass clippings or weeds get entangled with this moss, it can smother the moss and stunt its growth. The color of the moss is a dark green but can have a silvery white hue to it. The moss can grow in large clusters and look similar to a bush with its lush green foliage. They are excellent at absorbing and retaining water. The clumps can also detach themselves and may be found lying on the soil surface. This moss would make a great addition to any shade garden, rock garden, or can even be used as an alternative to a grass lawn. Cushion moss has a cushion-like appearance that comes from growing thick and rounded, but the term, “cushion,” actually refers to woody plants that are low growing, spreading like mats and putting down deep tap roots. The color of these plants is a light green that has a silvery-white overlay to it.